Corneal surgery techniques have improved dramatically over the last decade. Improvements include more sophisticated operating microscopes, finer surgical instrumentation, and refined technique of corneal transplant such as Descemet’s Stripping Automated Endothelial Keratoplasty (DSAEK). 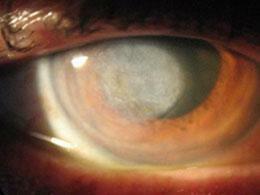 The prognosis in corneal transplantation is excellent in most cases. Jeehee Kim, M.D., of Polaris Eye & Laser, Inc., specializes in surgical and medical management of corneal disorders, cataract surgery, and refractive surgery. As a fellowship-trained cornea, cataract, and refractive surgeon, her clinical expertise includes advanced techniques for cataract surgeries, corneal transplantation surgeries including DSAEK, anterior segment reconstruction, and management of corneal and external diseases. She also performs refractive surgeries (LASIK, LASEK, PRK, and other surgical correction for refractive purposes, such as post transplantation). In the United States, approximately 40,000 patients receive corneal transplants each year. The waiting list for suitable transplantable donor material can be long, and there is always a need for more donor tissue. We are fortunate in the state of California to have several excellent eye banks that have tremendously improved the availability of donor material. Listed below are Frequently Asked Questions about corneal transplantation and how donor tissue is obtained. Additional information about the corneal tissue and corneal disease can be found on the National Eye Institute Web site: www.nei.nih.gov. The cornea, situated at the front of the eye, is the transparent dome of layered cells overlying the colored iris of the eye. In its normal state, the cornea is composed of thin layers of tissue that allows rays of light to pass through and be focused on the retina. The cornea and the lens of the eye, a separate structure located just behind the iris, are responsible for creating a sharply focused image on the back of the eye so that we can see clearly. The cornea is responsible for roughly two-thirds of the focusing power of the eye, with the lens responsible for the remainder. Many eye conditions affect the cornea and may change its transparency. Injuries, infection, inherited conditions, or aging changes may cause clouding or distortion of the cornea with decreased or distorted vision. Sometimes vision can be improved with glasses, a contact lens, or medications. However, when non-surgical treatment fails, a corneal transplant may be necessary to improve vision. 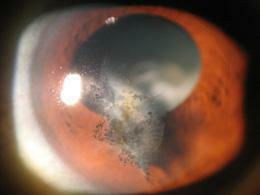 Cornea after PK (Penetrating Keratoplasty). There are two basic approaches to corneal transplant: Penetrating Keratoplasty (PK) and Descemet’s Stripping Automated Endothelial Keratoplasty (DSAEK). 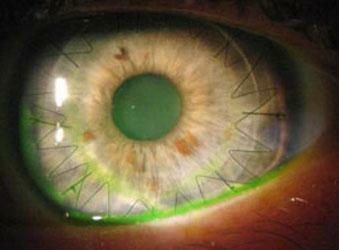 Penetrating Keratoplasty (PK) has been the standard technique for corneal transplantation for many years. Your surgeon removes a central portion of the diseased cornea, approximately the size of a small shirt button, and replaces it with a clear full-thickness tissue obtained from a donor cornea. 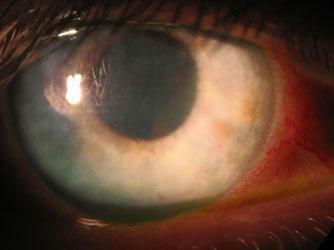 This technique of corneal transplantation is commonly used for treatment of keratoconus, corneal scarring, or other corneal diseases that affect all layers of the cornea. The new cornea is held in position with very fine suture material that may remain in place for months or years. After a corneal transplant, it may take some time for the vision to improve. The vision will be limited by corneal swelling and astigmatism. Astigmatism is an irregular cornel shape and affects every patient undergoing a corneal transplant. It may ultimately be necessary for one to have glasses or a contact lens in order to obtain the best sight possible. In general, some stitches may be removed between 3 and 6 months, and then additional sutures may be removed at a later time to minimize the astigmatism. Glasses are not prescribed until the cornea is sufficiently stable to give a substantial improvement in vision. This newer technique of partial-thickness (posterior lamellar) corneal transplantation is used to treat corneal edema resulting from diseases of the endothelium, the innermost layer of the cornea. DSAEK is a highly refined technique that replaces just the endothelial layer of the cornea, allowing surgeons to target the specific cause of the patient’s vision loss. In the DSAEK procedure the damaged cells are stripped from the patient’s eye and replaced with a very thin back portion of a donor cornea. This procedure allows your surgeon to replace only the damaged area of cornea, allowing a more precise treatment and faster recovery. Your surgeon uses an air bubble technique to hold the new tissue in place in the eye so that no sutures are needed. A large proportion of corneal transplants are performed each year in the United States for corneal endothelial failure as in Fuchs' corneal endothelial dystrophy and corneal edema after cataract surgery. Many corneal diseases previously requiring a full-thickness, traditional corneal transplant can now be treated with this newer surgical technique. Advantages of this technique include a more rapid recovery of vision after surgery, a smaller surgical wound and ability to achieve optimal vision after surgery with glasses instead of a contact lens. Any condition that causes permanent clouding or distortion of the cornea may result in poor vision and, therefore, require a transplant. Common corneal conditions such as Fuchs' corneal endothelial dystrophy and corneal edema after cataract surgery are often condition for which corneal transplants are performed. It is also offered as a treatment of corneal scarring resulting from infection, including bacterial or herpes simplex virus (HSV-1) infections of the cornea. Advanced stages of keratoconus, a disease causing abnormal protrusion of the cornea and severe distortion of the corneal contour, can be treated by corneal transplant. Repeat corneal transplants sometimes are necessary following rejection or failure of a prior corneal transplant. There are other factors to consider in deciding who may benefit from this operation and at what time. The health of the rest of the eye is a key factor. If there is severe or irreversible retinal damage concurrent with the corneal disease, this may limit the potential of the eye to achieve good central vision. Glaucoma, or a high pressure in the eye, is often associated with corneal disease and may actually worsen after the surgery. Other considerations include the vision in the opposite eye, whether the corneal condition is causing severe pain, and the relative prognosis for the specific condition that caused the decreased vision. Additionally, any past eye surgery must be taken into account with regard to the effect it may have on further surgery. How is Donor Material obtained? The donated cornea will come from a recently deceased person who had either decided to be an eye donor or whose family has made a humanitarian gesture in donating the eye so as to aid in the restoration of sight. The health of the donor material is carefully inspected before it is used, and screening tests are done to exclude transmittable diseases. 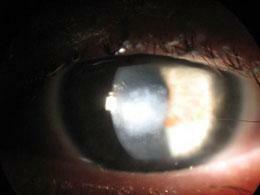 If there is evidence of transmittable disease present, the corneas are not used. To protect the privacy of the donor and his/her family, the details of the donation are not revealed. The donor tissue is placed in a special preservative solution which maintains the health of the donor cornea until the time of surgery. What is the Purpose of an Eye Bank? The eye bank is a non-profit organization that sets a fee for transplant corneal tissue and covers the expense of obtaining, processing, and transporting the donor eyes. It acts as an intermediary between the next of kin for the patient donating his/her eyes after death and the eye surgeon who will perform the corneal transplant. The eye bank arranges to surgically retrieve tissue, antiseptically preserve it, and oversees various tests to assess the potential viability of the cornea if used for transplantation. In most cases of Penetrating Keratoplasty (PK), the stitches will be removed 3 months to 1 year after the operation. Some stitches may be left indefinitely. The stitches in an adult patient will be removed in the office after placing numbing drops on the eye. Stitch removal in children is generally done under general anesthesia. For Descemet’s Stripping Automated Endothelial Keratoplasty (DSAEK), there usually are no corneal stitches to be removed which results in a more rapid recovery of vision after the surgery. What can I Expect in the Hospital? The surgery is typically performed on an outpatient basis. The surgery is done under local or general anesthesia and may take from one to two hours. Written instructions concerning medications and an appointment for the first postoperative visit will be given at the time of discharge from the hospital. What if my Cornea is Rejected? Transplant rejection usually will not occur within the first two weeks after surgery. The major cause of early clouding of the transplant is not rejection but failure of the donated tissue to regain its vitality. If a rejection episode occurs, it is usually within the first month to 2 years after surgery. It is uncommon for a transplant to reject after 2 years, although this can happen on rare occasions. If graft rejection occurs, more than half the time it can be reversed by early treatment with eye drops. The signs and symptoms of rejection are redness of the eye, increased light sensitivity, decreased vision in the eye, and pain in the eye. With modern techniques, corneal transplant surgery can in most instances restore useful vision to eyes affected by corneal diseases. While a guarantee of good vision cannot be made, the success rate from this procedure is now very high. Dr. Kim of Polaris Eye & Laser, Inc., will help in any way possible to restore your vision.